The Courtyards at Waverly Woods is a 55+ community located in Marriottsville, Maryland. This beautiful active adult community has 462 residences built by Ryan Homes and NV Homes. The Courtyards at Waverly Woods' combination of charming amenities, low-maintenance residences, close proximity to golf courses, and prime location are ideal for today's active adult homebuyers. Residents have charming amenities in the quaint clubhouse. Homeowners can stay in shape by using the exercise room and aerobics studio. They can socialize with neighbors in the multi-purpose room, or prepare a snack in the catering kitchen. An outdoor pool will be the perfect place to cool off during the warmer months of the year. There are plenty of amenities around the corner from active adult community as well. Homeowners can purchase a membership and access the clubhouse located at Waverly Woods East, an adjoining neighborhood. In addition, Waverly Woods Golf Club is a public golf course that provides 18 holes of championship golf and is located across from the community. Ryan Homes and NV Homes broke ground on this luxurious 55+ community in 2012, and has 462 residences. Ryan Homes offers condo units with the Chambord floor plan. It has 1,489 square feet of living space and have two bedrooms and bathrooms, as well as elevator access and a parking lot. All units include a patio or balcony and a spacious master suite. Townhomes by Ryan Homes offer approximately 2,100 square feet with the Griffin Hall floor plan. The Griffin Hall plan offers three bedrooms, two-and-a-half bathrooms and an attached two-car garage. The first-floor owner's suite features high ceilings and spacious walk-in closets, providing a combination of sophistication and functionality. With gourmet kitchens, stainless steel appliances, and private patio areas entertaining is made simple at The Courtyards at Waverly Woods. In addition to condos and townhomes, The Courtyards at Waverly Woods offers low-maintenance single-family homes. There are three floor plans that provide 2,068 to 2,432 square feet of living space. Each home features two to three bedrooms, two to three bathrooms, and an attached two-car garage. These residences also have full basements with plenty of storage space, ten-foot ceilings, and granite countertops. 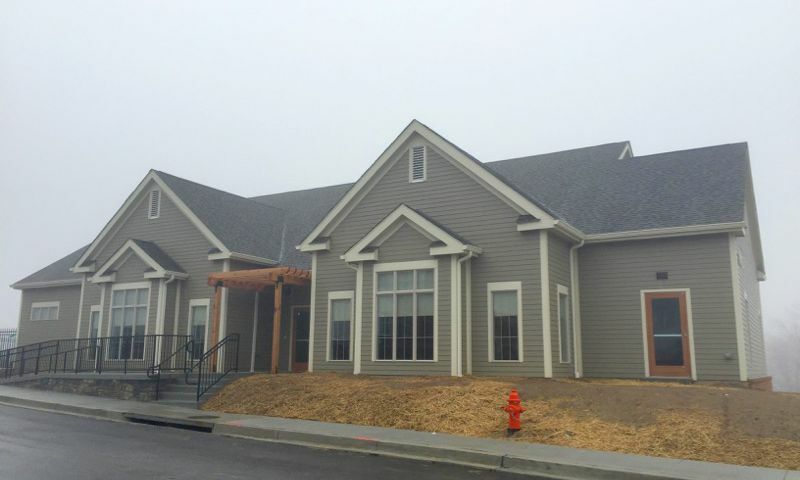 The Courtyards at Waverly Woods provides an exclusive clubhouse to homeowners of this 55+ community. This age-restricted community will offer residents plenty of fun neighborhood events and activities. Additionally, residents can obtain memberships at Waverly Woods Golf Club and attend many events featured at their clubhouse. Residents also have more time to enjoy these amenities because they don't have to worry about exterior home maintenance. The homeowners' association fee takes care of snow removal from driveways and walkways, lawn mowing, and annual mulching. The Courtyards at Waverly Woods is located in Marriottsville, Maryland. It is conveniently located off of Interstate 70 at the intersection of Barnsley Way and Marriottsville Road. Situated near shopping, dining, and entertainment, The Courtyards at Waverly Woods is the ideal location to settle down in the prime area of Western Howard County. Its close proximity to the interstate provides easy access to other cities like Baltimore, Ellicott City, and Columbia. Golfers love the close proximity to many golf courses, like Waverly Woods Golf Club, Turf Valley, Fairway Hills, and many more. The Courtyards at Waverly Woods offers a low-maintenance lifestyle to 55+ homebuyers in a great location in Howard County, MD. A paid membership at Waverly Woods Golf Club allows residents to have unlimited access to the club's amenities. Residents can also pay to play on the public golf course. Check back soon for more information on the lifestyle in The Courtyards at Waverly Woods. Ryan Homes offers condo units with 1,489 square feet of living space and have two bedrooms and bathrooms, as well as elevator access and a parking lot. All units include a patio or balcony and a spacious master suite. The low-maintenance townhomes provided by Ryan Homes are ideal for today's active adult. At 2,100 square feet these two-level homes feature three bedrooms, two-and-a-half bathrooms, and an attached two-car garage. There is an owner's suite on the main level and additional bedrooms on the upper level for guests. The main-floor master suite features a large walk-in closet, dual vanities, and natural light. The lower-level area provides plenty of storage options. These homes are available on a resale-only basis. The single-family homes built by NV Homes feature first-floor owner's suites, zero-step entries, granite countertops, and soaring ten-foot ceilings. These beautiful homes range in size from 2,068 to 2,432 square feet and have two to three bedrooms, two to three bathrooms, and an attached two-car garage. There are even full basements with plenty of storage options. All bedrooms in this single-family collection are main-floor master suites. The NV model home is gorgeous! We're really considering buying here but it is a tad out of our price range. However, we like that it's a new community and the quality of construction seems above what we've seen at other communities. Our only concern is that it's a combination of townhomes and single family, so we're wondering how townhomes would affect the resale value of the single family homes. 55places.com is not affiliated with the developer(s) or homeowners association of The Courtyards at Waverly Woods. The information you submit is distributed to a 55places.com Partner Agent, who is a licensed real estate agent. The information regarding The Courtyards at Waverly Woods has not been verified or approved by the developer or homeowners association. Please verify all information prior to purchasing. 55places.com is not responsible for any errors regarding the information displayed on this website.